The contraption used by the 1st MLG is called an Automated Construction of Expeditionary Structures (ACES) printer. It’s not deployable yet. However, the Marine Corps has high hopes for using ACES printers in the field, Capt. Matthew Friedell, the team leader of the Advanced Manufacturing Operations Cell in the Marine Corps Rapid Sustainment Office, said during a media conference call today. Friedell previously wrote about the possible Marine Corps uses for 3D printing in the October 2016 issue of Proceedings. The 3D printer provides a level of flexibility the Marine Corps appreciates given its mission that often requires being agile while operating down range. 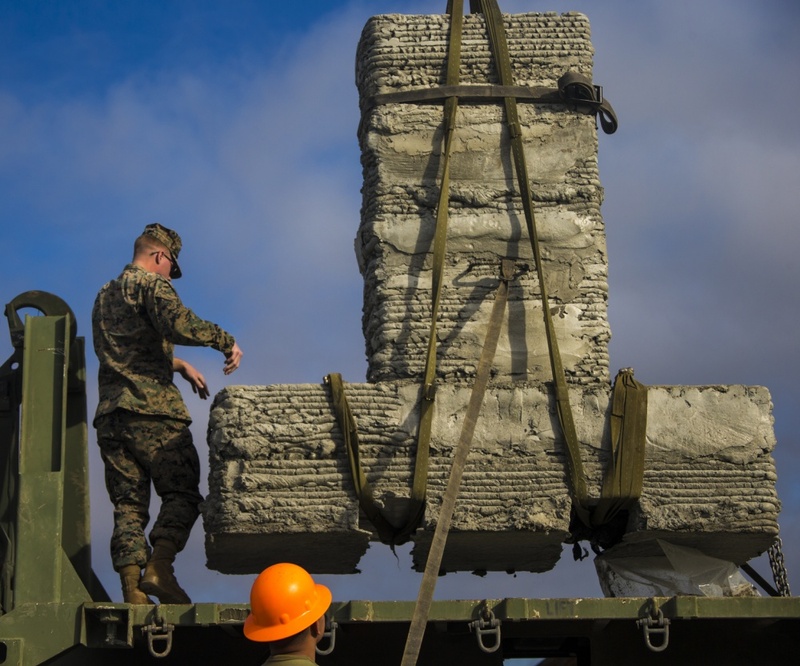 The Marines do have bridge technology that can deploy, Friedell said, but the 3D printer allows engineers to create custom-made structures for crossing any gap. U.S. Marines with 7th Engineer Support Battalion and Sailors with Naval Mobile Construction Battalion 5 attach a hose onto a 3D concrete printer during an exercise at Camp Pendleton, Calif. Marine Corps photo. The high-end fights of the future will not necessarily allow for the same steady stream of logistical support the Marine Corps has relied on recently, Marine Corps leaders have said. Military planners could disperse pockets of Marines to several locations, so the more capabilities they can bring with them, the less they will have to rely on supplies sent through shipping lanes vulnerable to attack. “We’ve always had welders and the ability to haphazardly make things, but now we’re starting to discover these technologies to do more precision milling and manufacturing,” Friedell said. 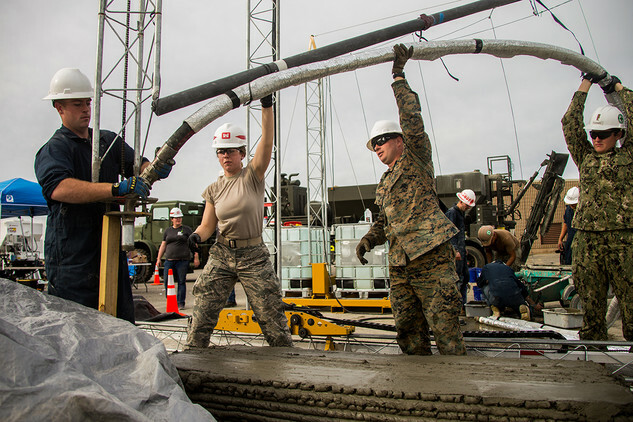 While the Marine Corps is still experimenting with additive manufacturing and 3D printing involving large concrete and aluminum printer systems, units throughout the service already have access to about 150 smaller 3D printers. These can be used to create small parts or even clasps for uniforms. 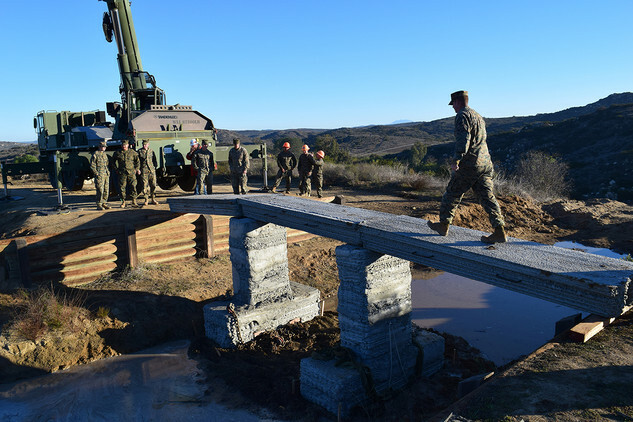 A Marine with 1st Marine Logistics Group walks across a concrete footbridge during a 3D concrete printing exercise at Camp Pendleton, Calif. Marine Corps photo. A recent example, Friedell said, was a unit that had problems with a snowshoe clasp that kept breaking. They emailed a photo of the clasp next to a ruler to Friedell’s team, which reversed-engineered the clasp and emailed back data for a stronger clasp that could be printed by the unit themselves. Such uses will become increasingly common, Friedell said. The possibilities for 3D printing applications are limitless. The only restraints right now are working out intellectual property deals with industry, he said. Within three to four years, he suspects industry and the Department of Defense will have worked out agreements for using product designs for small quantities of 3D printed products.